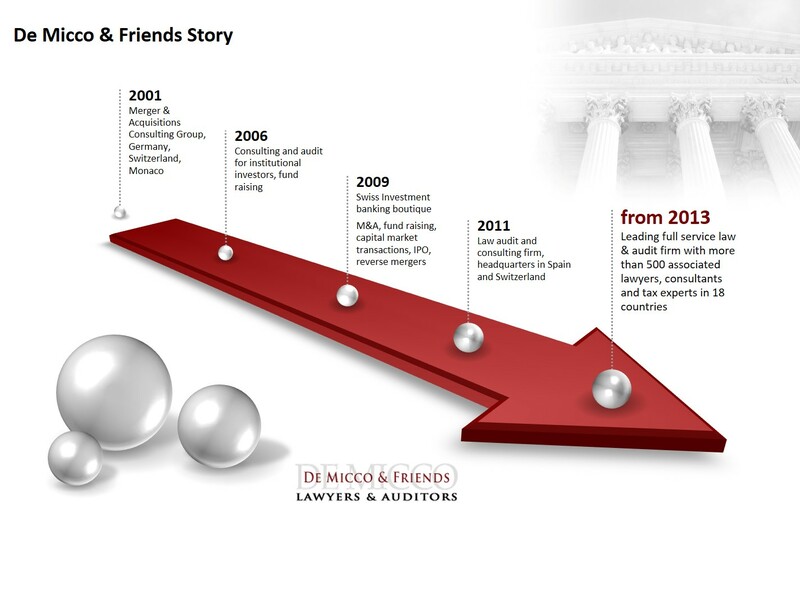 De Micco & Friends group develops and organises strategic and legal corporate and capital market transactions, such as M&A, financing and IPOs. 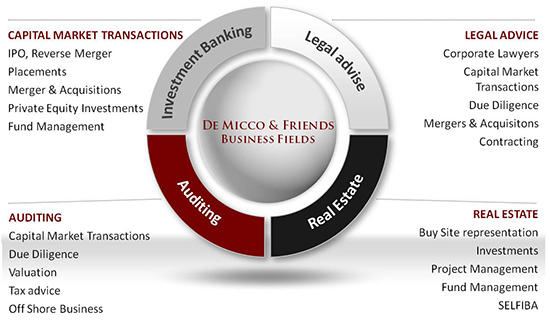 The De Micco & Friends Group is a consultancy and transaction company focused on the implementation of capital market and merger & acquisitions transactions for medium-sized and larger firms. The group’s core strategy is based on a partnership concept through which experts from the fields of lagal advice, audit and tax advice. The group also is active as investor in so-called "Late-Stage Phases" and in capital market transactions such as share placements of stock market listed companies in the area of capital increases, private placements and block transactions. Typically the transactions are managed and implemented by the group itself. Investments are made primarily in small and medium stock market listed companies. Innovative private companies at certain stages of their growth, e.g. in the preparation for a planned IPO, are also financed. De Micco & Friends consulting concept is quite different. The focus of all consulting projects is not any new strategy or method. Here the central focus always creates a specific, desired, and actionable transaction. We do not ask what possible, theoretical objectives can be achieved through various strategies. It is more about what strategy and tactic must be developed to implement a concrete, entrepreneurial goal. De Micco & Friends consulting goes one important step further. We not only develop a new or modified strategy, but also deliver or coordinate, on this basis, the concept and the practical implementation for our clients. The Senior Partners of the group are experts in the international world of finance, since they are actively experiencing and shaping it themselves. There expertise is both from the perspective of operating entrepreneurs, as well as from the perspective of investors and practical experienced Transaction experts. 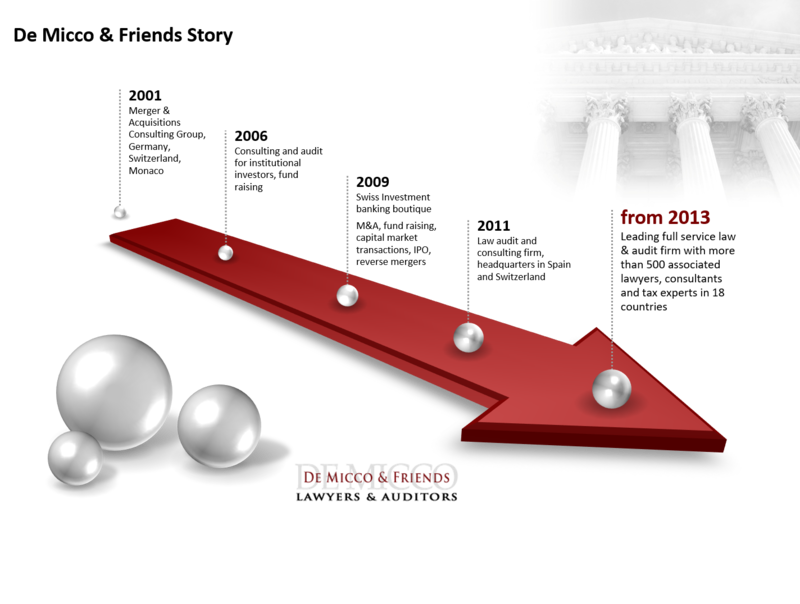 De Micco & Friends develops and organises strategic corporate and capital transactions, such as M&A, financing IPOs and reverse IPOs. The concept secures and increases a firm’s value, strengthening its equity capital throughout all business phases. The approach is completely different at De Micco & Friends. The focus of all consulting projects are not any new or modified methods or strategies. This counseling approach centers on a specific, desired and practical implemental transaction. To conclude, De Micco & Friends is methodically working out a strategy, set by the entrepreneurs’ goals. In other words, we do not ask what possible targets could theoretically or hypothetically be achieved by a particular strategy, but here it is ostensibly about what strategy must be developed to reach that specific business goal. De Micco & Friends takes two decisive steps forward. Not only do we develop a new modified strategy, but rather coordinate on this basis the concept and the tactics as well as the parameters and official requirements of the strategic elements. Each project is completed with the practical implementation and realization of the proposed transaction. Please contact us for further information. De Micco & Friends group is present in different countries. The operative headquarter Europe is based in Spain. By the senior partner concept, where lawyers, auditors, investment bankers, accountants and real estate experts works together in competent teams the group growths constantly by adding new locations and partners worldwide.